If you were looking for the foundation stone of Rolex as a brand, the Oyster Perpetual could well be it. The name is made up of the two most important developments in the history of the wristwatch, a duo of innovations by Rolex themselves which not only revolutionized their functionality, but also thoroughly transformed how they were perceived by the public, and in the process, sounded the death knell for the ubiquitous pocket watch. Before the arrival of the Oyster Perpetual, a timepiece worn on the wrist was the sole preserve of women, and usually very well-to-do women at that. Even though the trench combat of WWI had opened some eyes to the usefulness of a watch that did not require two hands to operate, the inherent flimsiness of their design—basically pocket watches jerry-rigged with a strap—meant a male audience was still few and far between. The main insurmountable problem lay in shielding the fragile internal mechanism from the elements. Where pocket watches were kept safe tucked away in a vest, only taken out to check the time before being quickly covered up again, wristwatches had no such protection and were always prone to allowing dust, water or perspiration to leak in. Enter Rolex founder Hans Wilsdorf. He recognized the drawbacks and went someway to overcoming them in 1924 with a piece he called the Hermetic watch. This secured the movement behind a screw down cap, but also, crucially, sealed the winding crown inside the case as well. The inconvenience of having to unscrew the watch’s lid every time you wanted to wind the mechanism or adjust the time though led to it being a relatively short lived contraption. In 1926, he went one further and patented his first ‘Oyster’ watch. Building on the Hermetic’s design, it not only featured a bezel and case back that screwed down against a middle section, but this time the whole thing was made watertight by the threaded winding crown itself, meaning the historically weakest part of a wristwatch’s construction became integral to its strength. As advanced as it was, and in the 1920s it was nothing short of radical, the Oyster cases only stayed impervious as long as the wearer remembered to screw the crown back in after winding the watch each day. Far too often that step was missed and movements would be destroyed by moisture seeping in under the exposed crown tube. The obvious solution was a caliber that wound itself, and Wilsdorf had that cracked just a few years later in 1931 with the development of the Perpetual movement. It built on the work of Englishman John Harwood, who had produced the first automatic calibers about a decade earlier, and had even gone so far as to put them into production. But his company fell victim to the Great Depression soon after, and with his patent up for grabs, Wilsdorf seized on it. Swapping Harwood’s limited rotor design for one that rotated a full 360°, Rolex perfected the concept and the initial Oyster Perpetual watches debuted in 1933—unveiled as the first self-winding and waterproof watches ever made. With very veryfew exceptions, every model to emerge from the brand since that day has borne the two words on their dial. Pieces known, for conciseness, as the Rolex Submariner or the Rolex Datejust are, technically, the Rolex Oyster Perpetual Submariner, etc. However, there has also always been, since 1933, a family of watches known simply as the Oyster Perpetuals. Modestly simple time-only examples, they more often than not represent the entry way into Rolex ownership, generally the least expensive offerings from the world’s premier manufacture. These are models that have been to the top of the world, and broken speed records both on land and in the air. Without them and their groundbreaking innovations, the watch as we know it today would not exist. Below, we will look at how you can take ownership of perhaps the most significant timepiece ever made. As we said above, Oyster Perpetual is something of a catchall term denoting Rolex watches that are both automatic and waterproof down to 100m. Since their introduction in the 30s, that initial range has splintered into the various specialty models—airline pilots got the Oyster Perpetual GMT-Master, scientists, the Oyster Perpetual Milgauss, for instance. All of them, at their heart, have the same basic DNA; the self-winding rotor and the Oyster case. The family of watches called simply the Oyster Perpetuals were not intended to be used as tools for any particular occupation; they were merely beautifully engineered timepieces made to last a lifetime. Out of all Rolex’s product line, they are the ones with the longest production run, outdoing even the Datejust, which feels like it has been with us forever. With such a long history, it stands to reason the price range is similarly as diverse. At the most accessible end, a vintage model forged in stainless steel can be had for less than $2,000. If you really shop around, it can actually be considerably less. Top end, and a very well looked-after piece in one of the brand’s three flavors of gold can reach anywhere up to the $20,000 mark. There has never been, so far, a platinum Oyster Perpetual, Rolex reserving the most exclusive of precious metals for their flagship models—the Day-Date, Daytona and the Lady-Datejust. In between those two extremes, you will be able to find plenty of fascinating and culturally noteworthy examples of the watch that started it all, in an expansive range of dial color, bezel, bracelet and metal combinations. 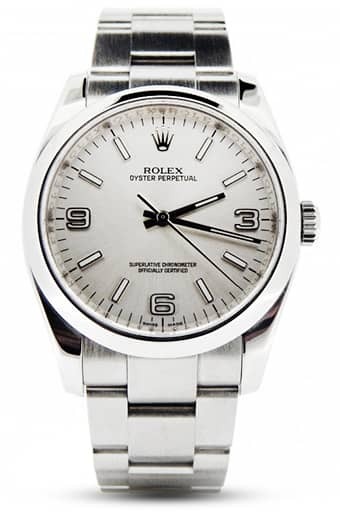 Interestingly, the modern range consists of watches made entirely from stainless steel, what Rolex have recently rechristened Oystersteel, a new name for the ultra tough 904L which is the sole reserve of the brand. So if you had your heart set on a gold piece, the pre-owned and vintage markets are the only way to go. A catalog mainstay for more than 80 years, the number of options in the Oyster Perpetual family is obviously going to be extensive. The use of different metals, as we have already covered, started out in the watch’s earliest days with the choice of 9k, 14k or 18k yellow or pink gold. It was also one of the first Rolex models to be released in Rolesor, the name the crown gives to its half and half steel and gold combination. Full stainless steel has always been an option, and again, the original pieces from the 30s were made from an alloy known as Steelium, before graduating through 316L up to today’s 904L. The bezel has also been presented in different forms. You will be able to find plenty of smooth bezel examples alongside those which are known as engine-turned. This process of machine cutting decorative patterns into the surround was a popular choice in the past but has sadly been discontinued in recent years. One other type, the fluted bezel, actually had its roots as a functional requirement, evolving from the original coin-edge design that allowed the watch’s maker to get a better grip as he screwed the bezel onto the Oyster case to form the watertight seal. It is an emblematic Rolex feature that is still very much in use today. Dials have enough variety to suit every taste. Rolex’s usual palette, from the monochrome of black and white to the traditional champagne and silver are plentiful, as well as more unorthodox tones such as oranges, reds and mother-of-pearl. The ultra minimalist and all-encompassing styling means there are not many colors that don’t work with the Oyster Perpetual, and it is really only a question of which you prefer. As for the hour indexes, the most commonly found are the plain stick batons, again just about as stark and austere as is possible. There is also no shortage of Roman numeral examples as well as pieces with a mix of both batons and Arabic markers, generally in the 3/6/9 Explorer dial form. Very occasionally you might run across diamond accented dials and bezels. The entry level nature of the watch suggests these are more often than not custom, third-party additions. By no means a problem, but if you were to sell the model on in the future, it is information you will have to disclose to the buyer. Another type you will see, rarely, is an arrangement with oversize numbers formed around an unusual concentric circle dial. These emerged for a short while on the most recent six-figure references from the 2000s and are relatively scarce—definitely a standout design and one that could possibly tempt as a future investment. Hands have stayed doggedly on the more dressy side of the Rolex range, rather than using the Mercedes style common to the brand’s sports watches. Very early examples used the sword-like dauphine type before changing into the humble baton. The most common bracelet on the OP, by far, is the three-linked Oyster. It is the one that perfectly fits the watch’s personality; a no-nonsense, utilitarian offering and the one that suffers the least amount of stretch over the years due to its strength. As you scan through the vintage pieces on offer, you will see the large number that have been fixed with leather straps, and it is a watch that looks particularly well suited to them. One other bracelet, the intricate, five-linked Jubilee which was originally created for the Datejust in 1945, is a common addition to the Lady Oyster Perpetual range. The Oyster Perpetual series has always been offered in a wide variety of different sizes, in order to appeal to the broadest audience possible, both male and female. That size range has increased steadily over the watch’s eight decade run, with the smallest at one time being just 24mm in diameter, whereas currently, the modern collection starts at 26mm. Each of those are now obviously aimed at women, but back when the OP was unveiled, men wore significantly smaller pieces than would pass today. So the early examples from the 1930s and 1940s would rarely get above 32mm, and it would take until the 50s, and the beginning of Rolex’s first golden age of tool watches, that it made its first tentative steps towards larger proportions. A 34mm option has been available since then, nowadays known as a midsize, and a 36mm appeared soon after. 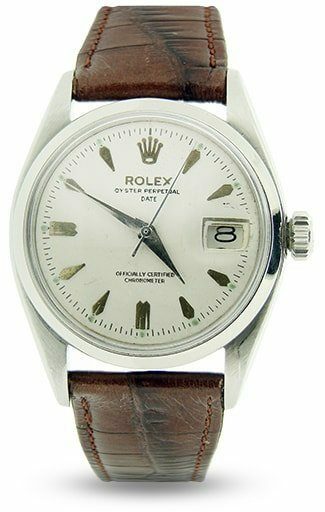 That was the most popular for decades, considered ideal for a dress watch, seeing as it still had enough surface area to be easily legible, but was able to vanish under a shirt sleeve when needs be, something not always possible with its 40mm-plus contemporaries. However, since 2015, Rolex have stepped it up again and introduced an elegant 39mm Oyster Perpetual, designed to cater to younger buyers. It follows the pattern of a lot of the catalog, apart from the core family of real icons such as the Submariner, the GMT-Master and the Daytona, to offer just a bit more watch for the money. Others at the less sporty end of the spectrum have likewise been granted bigger versions; the Day-Date now has a 40mm model, the Datejust has a 41mm. Consequently, you are going to be able to find a size to suit you, whether you are looking for a vintage model or one from the present-day selection of 26mm, 31mm, 34mm, 36mm or 39mm. As the blueprint for everything that followed, the Oyster Perpetual has never had any sort of complication to speak of. With not so much as a date window to cram onto the dial, Rolex has been free to develop it as a time-only model with a design so clean and universal that it fits the bill wherever it goes and with whatever it’s paired. If what you want is the one watch that will serve for every occasion, that goes as well with a t-shirt and jeans as it does with a suit and tie, and has the ideal proportions for every wrist size, this is it. Its lack of functionality does not mean an absence of technological and engineering prowess however. The brand has always been relentless in its pursuit of creating the perfect chronometer, and their development of new and improved ways to make their timekeepers more accurate and robust is a constant work in progress. The Oyster Perpetual’s internal movement has been continually updated and enhanced, and its components replaced with ones forged from increasingly state-of-the-art materials as they have been invented, many times by Rolex. So, throughout its incredibly long history, it gained not only little touches of extra convenience such as a hacking seconds function in 1972 with the Cal. 1570, it has also gone through a number of frequency changes over the years—increasing from the original 18,000vph through 19,600vph before ending up with the brand’s trademark 28,800vph; lending the mechanism both an added element of precision as well as more protection when subjected to shocks. High performance alloys have been used for vital constituents, like the beryllium and copper composite known as Glucydur which affords the balance wheel a greater rigidity and resistance to temperature variations, and of course, the renowned Parachrom Bleu hairspring, made from niobium and zirconium with an oxide coating, a completely antimagnetic item which was introduced in 2000. What it all adds up to is a watch with no particular party piece, but one that does what it does better than almost anything else out there, wrapped up in one of the most versatile shells you could imagine. Although not as omnipresent as, say, the Day-Date or the Submariner, the Oyster Perpetual has always been with us, and its combination of modest good looks and attainable pricing, and the Rolex name on the dial, means it has long been a popular choice. That has led to no shortage of examples available on the pre-owned market, and it remains one of the best value for money propositions for both brand newbie and seasoned collector alike. This well-populated scene has kept costs down, and even models that qualify as rare are still attractively priced. There are, of course, exceptions. If you are a real fan of the ancients and want to add one of the earliest 1930s pieces to your hoard, it can put a severe dent in your net worth. Models like the ref. 1858, the very first Oyster Perpetual, surface occasionally at auction and can sell for tremendous amounts. Others from around the same era, however, are surprisingly realistic. These so-called Bubbleback models, the name coming from the convex case back needed to accommodate the fledgling self-winding rotor mechanism, are the epitome of vintage Rolex and can be had for as little as $2,000 to $3,000, depending on their comparative scarcity and, of course, their condition—80 years is a long time to keep a watch in good order. Among the more collectible of the modern versions are a handful of limited editions, and the one you will likely see for offer most often is a piece co-branded with Coca Cola. In the fifties and sixties, the drink maker commissioned Rolex to produce a very small number of OPs with their own logo, in its characteristic red, underneath the watch’s name at the 12 o’clock position. These were handed out to employees with 25 years service to the company and covered several of the Oyster Perpetual’s references. Seeing two of the most iconic trademarks of all time together on one watch is something that attracts fans in their droves, and each one usually comes complete with its own unique story; the recipient’s name and the date of the watch’s presentation is typically engraved on the back. Beyond that, the watch has never been the traditional first port of call for collectors, who have always gravitated towards those pieces which are more likely to get them noticed. Yet, like we are starting to see with the Air-King and Explorer, that could well be on the turn. As the Rolex sports range becomes ever more advanced and functional, there is a growing interest in the simplest type of watch, the humble three-hand chronometer which represents what made many fall in love with the brand in the first place. Investing in an Oyster Perpetual sooner rather than later could turn out to be a shrewd move. Following on from the success of its waterproof Oyster case in 1926, Rolex completed the wristwatch’s transformation from ladies accouterment to vital, robust tool for men in 1931 when Emile Borer, the head of research at long-time partner Aegler, secured the patent for John Harwood’s self-winding mechanism. Replacing Harwood’s semi-circular weight with his own design, a unidirectional rotor that turned a full 360°, it delivered constant tension to the mainspring and greatly improved the movement’s accuracy. Perhaps more importantly, it meant the crown only needed to be used to set the hands, meaning the weakest element of the watch could be left secured most of the time. The debut Oyster Perpetual, the ref. 1858, was released in 1933, powered by the Cal. 520 and featuring a three-piece case with a deeply convex back—coming to be called, unofficially, the Bubbleback. A couple of years later and Rolex had refined their movement’s balance wheels, christening them the Super Balance, which slimmed down the watches to a degree. In 1936, they released a pair of Oyster Perpetuals recognized as two of the most crucial models in the company’s history. The ref. 3131 and 3132 both used a two-piece case arrangement and were among the first to be available in a choice of materials. As well as 9k, 14k and 18k gold, customers could take their pick from Steelium or Rolesor. There were also three size options to appeal to either gender. Aesthetically, they signified a move away from the rectangular or cushion-shaped designs that Rolex had been using since the Art Deco period in the 20s and became a more rounded form. The look suggested the new watches were less pieces of jewelry than they were tools for serious professionals. The reputation of Rolex’s Oyster Perpetual watches started to grow, helped along by the patronage of some of the most illustrious names of the day. Continuing a trend that started when Hans Wilsdorf persuaded Mercedes Gleitze to wear one of his waterproof creations during her record-breaking English Channel swim in 1927, the brand joined forces with Sir Malcolm Campbell a few years later in 1935. The British RAF captain and racing motorist was the first person to break 300mph on land, piloting his Bluebird vehicle over the Bonneville Salt Flats in Utah. He had already broken his own speed records a number of times by then, five of them on a long stretch of Florida coastline called Daytona Beach. The intense conditions and bone-shaking vibrations presented the sternest tests for Rolex’s engineering, but Campbell’s watches performed faultlessly. The brand, then as now, was not shy in letting the world know. By 1947, their renown was such that another relentless pursuer of speed had only one watchmaker in mind when he made his own entry into the history books. USAF officer and test pilot Charles ‘Chuck’ Yeager wore an Oyster Perpetual as he took to the controls of his Bell X-1 aircraft before becoming the first man to break the sound barrier, on October 14thof that year. Back on the land, but still a very long way up, 1953 saw Rolex accompany Edmund Hillary and Tenzing Norgay as they conquered Everest. As official sponsors to the attempt, the company furnished the entire team with standard OPs, the only concessions to the trials of the expedition being to fit extra long straps, allowing the men to wear the watches over their heavy clothing, and a new form of lubricant to keep the movement running in the extreme cold. The timepieces the team wore were sent back to Rolex following the climb and the following year the Explorer emerged; arguably the start of the Oyster Perpetual series dividing into the various specific tool watches we know today. With the range developing various talents designed to appeal to individual users—added water resistance and rotating bezel on the Submariner for divers, dual time zone caliber for airline pilots with the GMT-Master etc.—the basic Oyster Perpetual family started to serve more as the gateway into Rolex ownership. Nevertheless, its progress continued, receiving updated calibers throughout the decades all with the same single-minded aim of becoming the most precise and resilient timekeepers possible in a mechanical watch. Outwardly, that most functional and elegantly minimalist shape barely changed, as is true for most of the central Rolex family. New sizes were introduced as tastes changed, but the styling at the heart of the model has remained consistent. The most recent evolution has been 2015’s 39mm model, keeping the watch very much in line with the latest Explorer. In fact, on the black dialed OP, the only difference between the two is the hour indexes. Today, it is still the entry-level, offered in a wide range of dial colors on exclusively steel bodies. It may well be the most unassuming model in the canon, but the Oyster Perpetual is the genesis of modern Rolex. Its twin innovations laid the groundwork for not only the most successful manufacture of all time, but also every mechanical watch that followed. Stylish, sophisticated and inexpensive, if you are only going to buy one Rolex, it could well be the perfect choice.